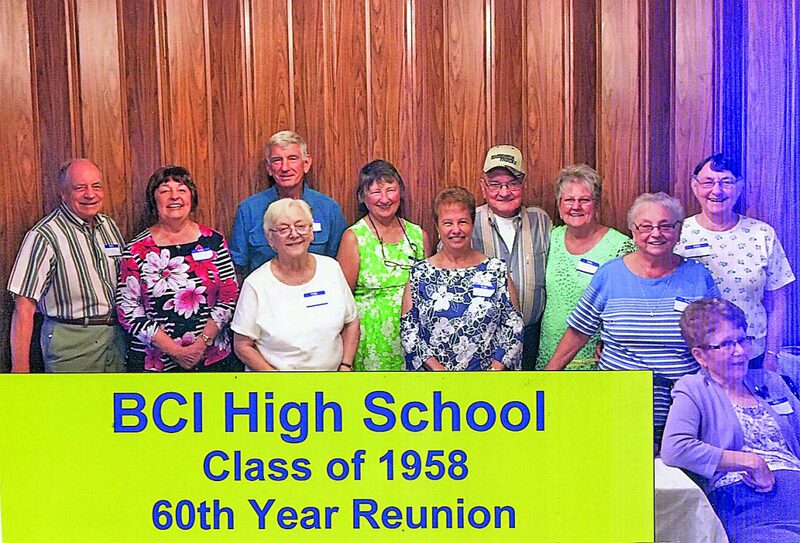 The Beccaria-Coalport-Irvona High School Class of 1958 celebrated its 60th anniversary Aug. 25 with dinner at Hoss’s Steak & Seahouse, Patchway Road, Duncansville, with 11 classmates and 10 guests attending. Shown are (from left): front row — Anna Mae (Bretzin) Rudnick, Verna (Bishop) Irwin, Janet (Spangle) Fleming and Joan (Daugherty) Knotts; back row — Ellis Dillen, Carol (Leyo) Morrison, David Shrock, Virginia (Bartek) Baca, Zane Irvin, Kathryn (Peacock) Longe and Ruth (Beals) Huey. The reunion was planned by Carol Morrison, Verna Irwin and Kathryn Longe. The tables were decorated with (the real) green Coke bottles from the 1950s era donated by Virginia Baca, and retro candy was scattered on the tables. The group had a discussion about the cost of living back then and now. The class expressed their desire to have a dinner get-together every year. Everyone received a 60th BCI anniversary pen.